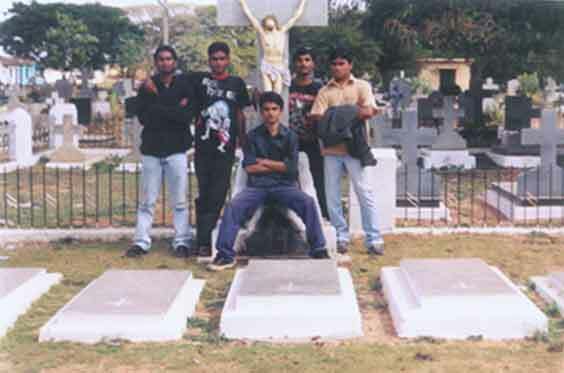 “Cremated Souls” is a five piece band from Bangalore, India.We came together in December 2001. We were all like-minded, aiming to compose good music, with a blend of Brutality and a pinch of Melody, yet to sound completely different from others. “SOLE DIMENSION”, the first demo brought about by “CREMATED SOULS”, after performing several live shows in the unexplored metal scene in India.We introduced a new genre, by adding a touch of melody into speedy riffs iced with haunting leads, blast beats and a taste of few Indian scales. With Pradyum on lead guitars, Ganesh on rhythm guitars, Canute on bass guitars, Mahran on drums and Charles on vocals, we are focused towards contributing quality music to the ever expectant crowd.All of us being self learnt musicians, have derived a lot of inspiration from the veteran bands, and thus have also added two covers along with a few of our own compositions to the demo, as a tribute to those who have influenced us.